North Korea; The Most Dangerous Border Crossing On Earth? The Most Dangerous Border Crossing On Earth? 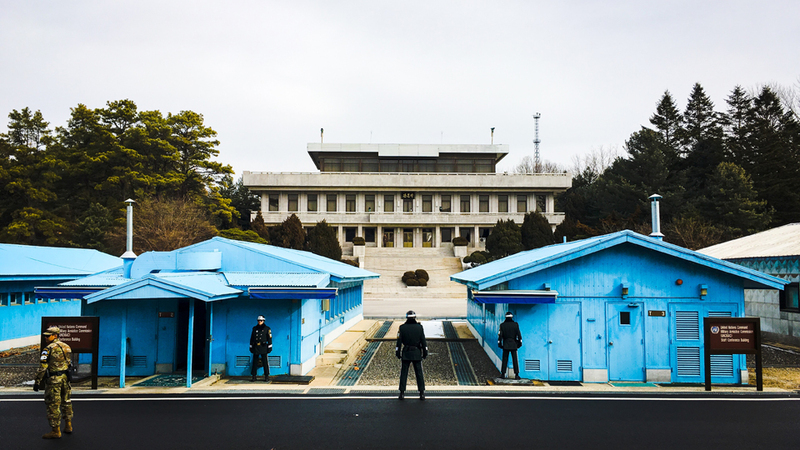 Panmunjom, Joint Security Area, DMZ, the 38th Parallel, call it what you want. There’s no denying the fact that the border between North Korea and South Korea is one of the most dangerous on Earth. So, what’s it like to step over the famous line in the sand? I had successfully booked a date for the visit after emailing the tour agency for over a week. Before leaving, you should make sure that your clothing fits the guidelines and don’t carry anything even remotely threatening on you. No holes in your clothes, no t-shirts, no loose clothing, etc. Easy enough I thought, luckily I brought nice pants and a button-down shirt with me! My alarm went off at 6:00, still sleepy, but ready for the experience I got up and began to get ready. Shower, clothes, fully-charged phone, passport, wallet, breakfast, and a short journey on the Seoul metro. I arrived at the Koreana Hotel in Gwangwhamun Square in downtown Seoul and made my way to the tour agency office. I received my ticket after a quick confirmation of my passport with the company. After a short walk around the area to grab some pictures and a stop at the local convenient store, I returned to the floor level of the Koreana Hotel at 8:40 for the bus ride. I instantly made friends with the person assigned to the seat next to me. They would be my conversation buddy for the next few hours. Random Fact: If you’re thinking about visiting this border without a tour guide, it won’t happen, military escorts must accompany you at all times. The trip started out simple enough, an introduction from the tour guide and some fun facts about Seoul. We left Seoul and after a short time of riding along the Incheon River we could start to see views of North Korea on the other side. No signs of life, just abandoned land and wild animals. One sight that could be seen was the village of Kijŏng-dong, a fake, uninhabited town created to lure South Koreans over. We were given waivers to sign which made sure to note that we would be “entering into a hostile area and the possibility of injury or death.” If adrenaline wasn’t already pumping through your veins, it will be now! We pulled up to a gate guarded by military personnel, no man’s land is just on the other side. Soldiers boarded the bus to check everybody’s passport; the gates lifted and we entered. We eventually arrive at an army base; Camp Bonifas, things get a bit more serious at this point. During a brief moment here we got to see an Apache helicopter land and then take-off; very exciting! “The world’s most dangerous golf course” located right here at Camp Bonifas was also something we got to see; where hitting a golf ball in the right direction could trigger a land mine to explode. Our soldier escorts appear after a moment and we switch buses from a standard civilian grade to a military grade. Passports are once again checked. Random Fact: The border between North Korea and South Korea is one of the most militarized in the world, according to the State Department. Pyongyang, North Korea has about 1.2 million military personnel compared to 680,000 in South Korea, where 28,000 U.S. troops are also stationed. We return to the road and are told about the area we’re entering; planted just beneath the ground of this area contains over 20 million land mines. This would certainly explain the bus switch, I suppose! Occasionally passing through massive barricades just wide enough for the bus to get through, we get closer to the border. All around us, triple barbed wire fencing, random barricades, bridges with bombs built in; just in case they need to blow it up. Eventually making it to the famous last building before the border. Don’t walk through that blue door! What would probably serve as the immigration building if there were no conflict, now houses soldiers and more security cameras than a Vegas casino. Inside is rather silent, we see men in suits passing through with heavy security around them. We stand in line at a staircase with no view yet of North Korea; or at this point the more proper name “Democratic People’s Republic of Korea” or “DPRK”. Our military escorts give us instructions on how to act and what to do and more importantly, not do! No pointing, no waving, no signaling, no staring, no communication, and so on, with the DPRK soldiers. One final check of our passports. After a confirmed understanding, we continue up and pass through the doors. Random Fact: In November of 2013, the DRPK government executed 80 people in public for watching South Korean movies and owning religious literature. Forced to watch, women and children were brought into a sports stadium where so-called “criminals” were executed by machine-gun fire. On the other side is North Korea’s equivalent border base and in between, three blue buildings. It’s these 3 buildings that share the border. South Korean (or Republic of Korea “ROK”) soldiers stand facing North Korea, hiding half behind walls, prepared to take cover if necessary. Several other ROK soldiers ordered us to line up, they needed to make sure we followed the requirements. Given the green light, we were now able to take pictures, but while only facing to the north! After about 2 minutes, we line up again and prepare to enter one of the blue buildings. The building is rather simple inside, on the South and North Korea borderline is a desk. The walls and doors are all blue, just like the exterior. The moment you pass halfway by the table, you are now in North Korea. Luckily for us, there are ROK soldiers standing guard. An interesting fun fact is that you are legally free to walk through the other door, but once you do so, the Republic of Korea can no longer protect you. ROK soldiers will often hold each others hands while clinging to the wall upon opening this door. This helps prevent any DPRK soldiers from pulling them over and capturing them. Everyone is posing with ROK soldiers and smiling for pictures, but they show nervousness and excitement at the same time. The feeling here is hard to describe. The soldiers don’t move at all, they are absolute statues. Not allowed to get within less than 6-inches of a soldier, I have my picture taken (with) one. The tour guide took a group picture, though if you want a copy you’ll need to pay an inflated price. However, it goes towards a good cause, which is helping those who have defected from North Korea. Random Fact: According to the UN, as many as 2 million North Korean people died as a result of famine in the 1990s caused by erratic government farming policies and flooding. Asia Press reported that a recent return of famine in the farming provinces of North and South Hwanghae has forced some to resort to cannibalism. We weren’t here for too long before a return to safer territory. Everyone takes a glance back to remember this moment. Lunch and a visit to the location where the last train to pass over, still full of bullet holes, rests on the tracks. There is nothing left of the bridge that held the train tracks. 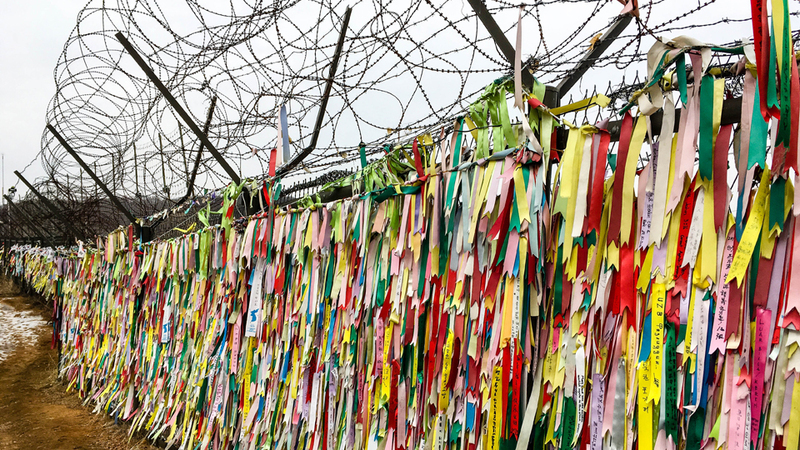 Prayers written on peace ribbons possibly for loved ones are tied along tall barbed wire fencing; possibly family members trapped in North Korea to continue the bloodline. Or perhaps those who were killed while defending their freedom, or simply lost their lives as civilians in the cross-fire. Overall this was an experience that will shake you, a harsh realization of war and conflict. One more shattering experience waited in store for us, though; the ability to interview a defector from North Korea! The experience of learning directly what life is like in North Korea was shocking. What did she risk attempting to escape? What she was willing to do with her daughter whom she also smuggled out. How far did she travel before finally arriving in South Korea? That will serve as my next article, so be sure to check back soon! Next → Next post: Why You Shouldn’t Visit Japan During The “Golden Week”. Wow what a unique experience! And I can’t wait to read your interview with the defector from North Korea… that must have been a fascinating and eye opening conversation. Thanks for reading! Yea, it was pretty intense to listen to what she had been through. I hope to be done with the next article soon! Your article gave me the shivers. I was truly immersed in the experience as if I was travelling along in your backpack. I cannot comprehend this conflict and always pray for peace in our world. The fact that even loose clothing is forbidden is scary. As much as I would love to go to every country in the world, there are some that just aren’t going to be possible if the process is just too scary or daunting. Thanks for sharing this experience. It sure opened my eyes more on the issues at hand overseas. Thank you! It’s certainly an experience I won’t forget and I encourage many to take. The entire time I kept thinking “something REALLY needs to be done to help these people”. 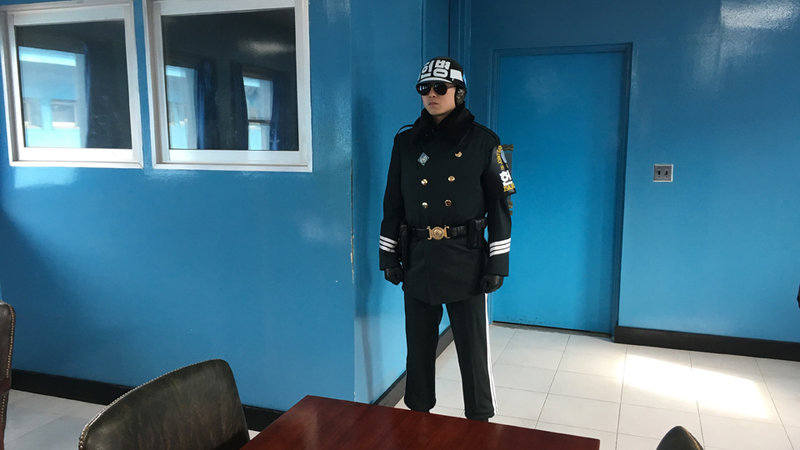 At first, the clothing rules confused me, but I guess North Korean guards take pictures of those who visit and if you’re wearing what appears to be “poor” clothing, photos of you will be used in propaganda films, so it’s something South Korea wants to help prevent. That one is a great article! Article about the reality. We always make jokes about North Korea and people do know that it’s under very strict regime but no one knows how horrible the reality is. You are brave one, keep posting more of what I would call journalism and not just simple blogging! Thank you very much! Yea, I’ve gotten a laugh out of some of the pictures of the Kims that float around on the internet, but what the family really does is deeply disturbing. This experience has really woken me up to the atrocities here. I understand; it’s one of those situations where the reality of it is tougher to take than what you expected. Interesting. I have often thought of going. I think you may find some of the border crossings in Africa would take the medal for most dangerous on earth. We have a friend who had a travel partner shot for not paying a bribe. True story. We’ve been to North Korea and it is definitely a unique experience! Are you planning on going back there? I wouldn’t mind returning to visit a bit more of the country, but until things settle down, I’m going to avoid it as an option. I would like to check out the on-going hotel that’s been in construction since the 80’s, hahaha!